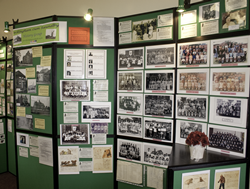 This year the History Group, led by Freda Proudley, held its Open Day along the theme of "Education through the years" at The Recreation Room. Doors opened 11am to 4pm and it was estimated that approximately 200 people visited throughout the day. In view of the amount of material a marquee had been erected in the grounds to give an additional display area. There was a re-enactment of a schoolroom complete with children’s desk and chairs and a blackboard. 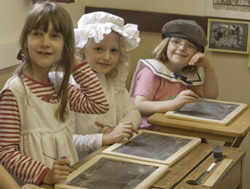 Two teachers, Joan Sanger (retired) and Sue Allen, gave lessons in the traditional style and dress and visiting children were offered the opportunity to take part using slates made out of material from The Institute roof by Wharton’s Joinery . The children were also invited to dress the part, girls in pinafores and mop caps and boys in collars and flat caps. 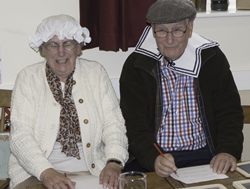 Although there was a cane the only punishment given out during the day was lines to two ex pupils who were misbehaving, Shirley Wilson and Rex Madin! Alongside was a table of modern day craft materials for the children to enjoy some of which had been donated by the school. June this year. Bassetlaw Museum also loaned some material for the day. The Web Team displayed their web pages in keeping with the theme and there was a rolling slideshow of photographs run by Albert Phillipson. In addition there was a collection of old toys that had been kindly donated for the day by Ruth and Nigel Walton of Carlton on Trent. 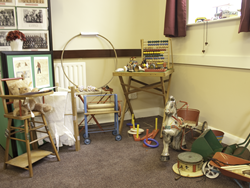 Amongst these toys was a collection of tin plate vehicles, various children’s household toys such as a washing mangle and ironing board complete with iron. There was also a miniature toy lawn mower and wheelbarrow, a number of traditional wooden toys made for the day by Brian Suart and Pete Jackson, skipping ropes, marbles, xylophone, hoop and conkers. The History Group had on sale their book published in 2007 of photographic memories of Beckingham and Saundby and a competition to name the teddy bear in the toy high chair (which raised £43.00) was won by Mr Alan Tyler, caretaker of Beckingham School. Refreshments were served throughout the day by a dedicated group of volunteers to approximately 200 visitors.